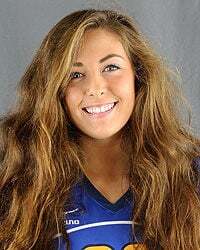 SIOUX CITY -- The Briar Cliff University student who fell 100 feet to her death in northwest Arkansas on Saturday was on a school trip at the time. Authorities said Andrea Norton was fatally injured after accidentally losing her footing while reportedly re-positioning herself for a photo on Hawksbill Crag, a prominent rock formation within the Ozark-St. Francis National Forest. Norton, 20, was among a half dozen environmental science students who accompanied their instructor, Brian Hazlett, on a class hiking trip to the park, Briar Cliff spokeswoman Leslie Heying said Monday. Heying said she did not have any additional information about the trip. Newton County Sheriff Glenn Wheeler told the Springfield (Mo.) News-Leader that several government agencies and 61 people, mostly volunteers, responded Saturday to the accident, which occurred near Boxley Valley, Arkansas. Wheeler says the rocky outcrop, which gets its name because it resembles a hawk's bill, is widely considered one of Arkansas' most-photographed hiking areas. Several people have died in falls there over the years, most recently a 19-year-old University of Arkansas student who died after slipping off a small boulder in May 2016. After the 2016 fatal fall, Wheeler told the News-Leader that because Hawksbill Crag is on U.S. Forest Service wilderness land, he doubted there would be any effort to install safety fences. After learning of Norton's death Saturday, more than 250 people packed the college's chapel for a vigil that evening. "There was a profound sense of sadness and grief," Heying said Monday. "I think that just shows what a caring community the Cliff is." Monday was the first day of classes since the accident. Heying said the school is providing counselors to students, faculty and staff who request them. A native of Hot Springs, South Dakota, Norton was a triple major at Briar Cliff in biology, environmental science, according to her obituary. She later petitioned the school for an associate’s degree in global studies, which was awarded recently. She also was on scholarship for symphony choir and women's volleyball. She had interned as a naturalist at Dorothy Pecaut Nature Conservatory in Sioux City, as well as at Sanford Research, where she studied triple negative breast cancer, according to her obituary. Funeral services for Norton will be at 1 p.m. Friday at the Mueller Civic Center Theatre in Hot Springs, with Michael Molitor officiating. Visitation will be held from 5 to 7 p.m. Thursday at Chamberlain McColleys Funeral Home in Hot Springs. A scattering of her ashes at diverse places will take place at a date to be determined. A memorial is being established in her memory at Briar Cliff.